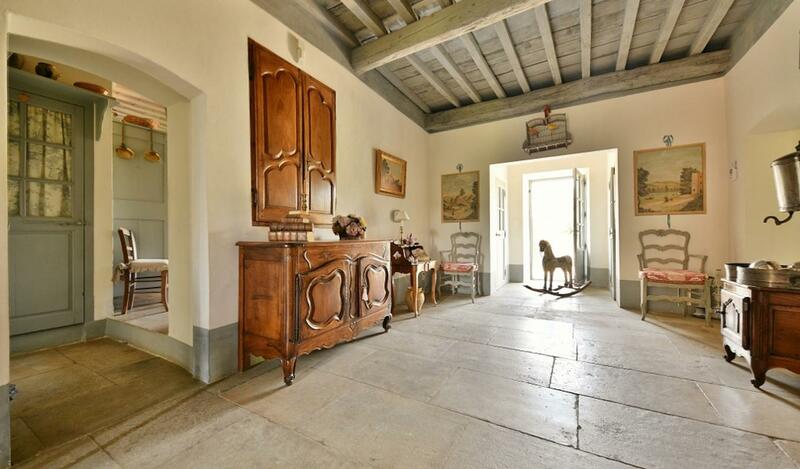 This exceptional village property is located in a high quality environment 12 km from Uzès. The ground floor hosts mainly summer rooms: the living room with Provencal ceilings communicates with the kitchen, in a row. on the other side of the living room, by a large French window, the covered terrace (superb vaults in ogive) shelters the summer dining room. Bathroom (basin, shower and cabinet) of guests. On the floor of the reception rooms, the majestic entrance hall serves (28 m²) on its left, the large living room: a large area (40 m²), this room has outstanding ceilings Provencal, and a stone fireplace, while its double exposure, gives it a great brightness. On the other side of the entrance hall, the dining room offers a beautiful carpentry work through its many built-in wooden cupboards. The main kitchen (22 m²), fully equipped, offers large worktops, a set of high quality household appliances and beautiful decorative wall tiles. The office (19 m²) faces the first garden. At the bottom of the entrance hall, an external landing accessible by a door window, down, by some steps, to the second garden and the swimming pool. The corridor serves the 4 bedrooms (16.50, 17, 17.50 and 22 m²) and two bathrooms of this level. On the second floor, the space is divided into 5 rooms that can be converted for a total of 253 m². In a related way, but completely independent (separate entrance, wall between the gardens), is a guest apartment, with a living area of 139 m², which offers a living room, a dining room, a kitchen, 2 bedrooms, 2 bathrooms (one with dressing room). This sumptuous property has a garage, 3 cellars, swimming pool with pool house.